Kells, Lindisfarne, Durrow . . . 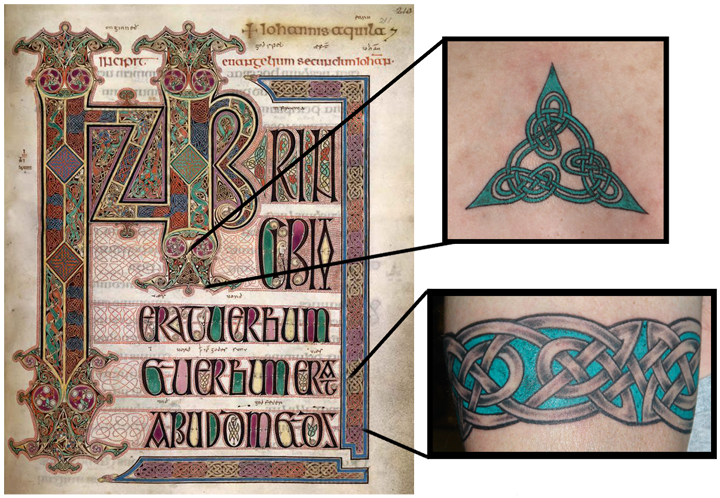 The single most inspiring examples of the art of the Middle Ages that provide designs for Celtic tattoos are the illuminated manuscripts of the British Isles. Before the printing press, holy books were transcribed and illustrated one at a time by monks living in isolated monasteries. With their intricate patterns and bright pigments, the surviving books of this era serve as a window into a time when the most beautiful artifacts were created to glorify God and the beauties of creation. Many of the decorations and illustrations in these artifacts make excellent tattoos - the page borders can become armbands, the tiny marginalia enlarge to form beautiful permanent jewelry, and the "carpet pages" provide excellent patterns for full knotwork sleeves - all bringing to life in skin these gems of centuries past. Often something that is the size of a small coin in a manuscript will need to be enlarged to several inches across to become a tattoo. We stand in awe of the precision, ingenuity and technique of these monks who created such magnificent art. Read on to see specific examples of Celtic Tattoos inspired by these wonderful pieces of history. "The Book of Kells is celebrated for its lavish decoration. The manuscript contains the four Gospels in Latin based on a Vulgate text, written on vellum (prepared calfskin), in a bold and expert version of the script known as "insular majuscule". The place of origin of the Book of Kells is generally attributed to the scriptorium of the monastery founded around 561 by St Colum Cille on Iona, an island off the west coast of Scotland. In 806, following a Viking raid on the island which left 68 of the community dead, the Columban monks took refuge in a new monastery at Kells, County Meath. It must have been close to the year 800 that the Book of Kells was written, although there is no way of knowing if the book was produced wholly at Iona or at Kells, or partially at each location." This "Triple Loop Band" Tattoo by Pat FIsh comes from the border of Folio 84 verso of the Book of Durrow. While Kells is easily the most famous Illuminated Manuscript, the Book of Durrow predates it by over a century. In fact, Durrow is the oldest surviving complete illuminated gospel known. It was mostl likely created in the late 600s AD in Northern England, or perhaps the Scottish Inner Hebrides. Like Kells, it is lavishly decorated and features "carpet pages" of amazing detail and complexity. 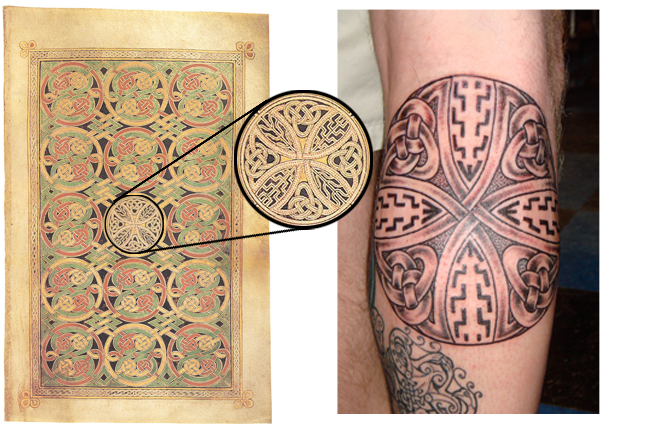 This "Disk of Durrow" Tattoo by Pat Fish is the center of a cross and carpet page, Folio 85 verso of the Book of Durrow. 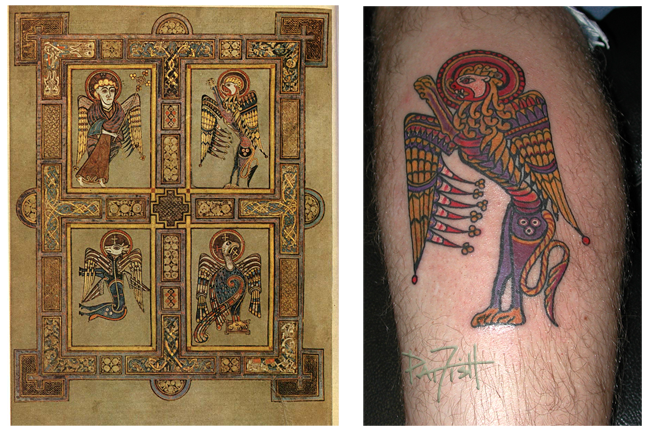 Here is an example of a carpet page from the Book of Durrow and the tattoo drawn from it. Note how much larger a complex design must be tattooed in order to be effective and legible in skin. "The Lindisfarne Gospels, one of the most magnificent manuscripts of the early Middle Ages, was written and decorated at the end of the 7th century by the monk Eadfrith, who became Bishop of Lindisfarne in 698 and died in 721." In November 2016 I was proud to be invited to travel to the University of Pennsylvania in Philadelphia and be part of the 9th annual Schoenberg Symposium on Manuscript Studies in the Digital Age, contributing a presentation on "Bringing Illuminated Manuscripts to Life in Skin." For more information about the event and to view my part of the video archive of the conference click here. MAKING AN APPOINTMENT with Pat Fish. If you are unable to make it to Santa Barbara, you can browse a selection of Illuminated Letter Tattoo Flash in the LuckyFish Art Store. 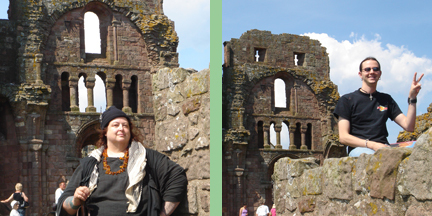 Pat Fish and Colin Fraser on The Holy Island exploring the ruins of Lindisfarne Priory, birthplace of a famous illuminated manuscript: The Lindisfarne Gospels.